INTENDED USE: The Malaria Pf/Pan Rapid Test Device (Whole Blood) is a rapid chromatographic immunoassay for the qualitative detection of circulating antigens of Plasmodium falciparum, Plasmodium vivax, Plasmodium ovale, Plasmodium malariae in whole blood. Malaria is caused by a protozoan which invades human red blood cells.1 World Health Organization estimates that 3.3 billion were at risks of acquiring malaria in 2006, with 247 million of these developing clinical malaria (86% in Africa), and nearly 1 million (mostly African children) dying from the disease. 2 Microscopic analysis of appropriately stained thick and thin blood smears has been the standard diagnostic technique for identifying malaria infections for more than a century.3 The technique is capable of accurate and reliable diagnosis when performed by skilled microscopists using defined protocols. The skill of the microscopist and use of proven and defined procedures, frequently present the greatest obstacles to fully achieving the potential accuracy of microscopic diagnosis. Although there is a logistical burden associated with performing a time-intensive, labor-intensive, and equipment-intensive procedure such as diagnostic microscopy, it is the training required to establish and sustain competent performance of microscopy that poses the greatest difficulty in employing this diagnostic technology. 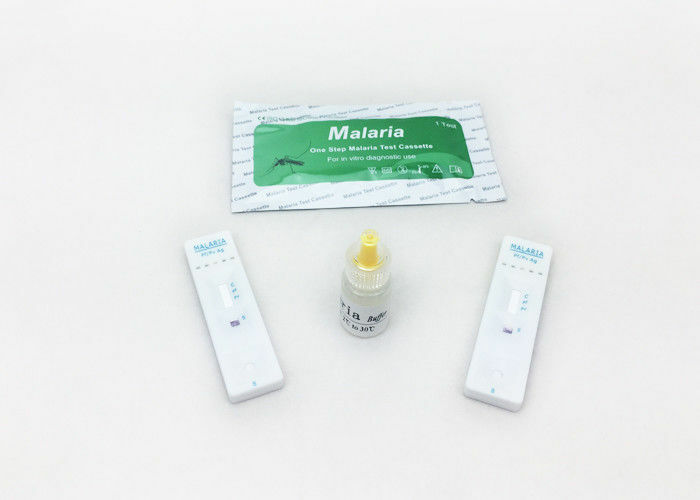 The Malaria Pf/Pan Rapid Test Device (Whole Blood) is a rapid test to qualitatively detect the presence of the P. falciparum - specific HRP-II antigens and/or Pan-malarial Lactate Dehydrogenase antigens found in P. falciparum (P.f), P. vivax (P.v), P. ovale (P.o) and P. malariae (P.m). The test utilizes colloid gold conjugate to selectively detect P.f-specific and Pan-malarial antigens (P.f, P.v, P.o and P.m) in whole blood. 1. Bring the pouched test device to room temperature(15-30℃) prior to testing. Do not open pouch until ready to perform the assay. 2. Remove the test device from the sealed pouch. Lay it on a flat, clean and dry surface. 3. Use the pipette to draw and slowly add 1 drop of whole blood to the sample well. 4. Hold the buffer bottle vertically and add 1 drop to the sample well. / If using a pipette, change a new one to avoid cross-contamination. Draw and transfer 2-3 drops of buffer to the sample well. 5. Interpret test results within 10-15 minutes. Do not interpret after 20 minutes. Caution: The above interpreting time is based on room temperature range of 15 - 30°C. If your room temperature is significantly lower than15 °C, then the interpreting time should be properly increased to 30 minutes. 1. NEGATIVE RESULT: If only the C band is present, the absence of any burgundy color in the both T bands (T1 and T2) indicates that no anti-plasmodium antibodies are detected. The result is negative. 2.1 In addition to the presence of C band, if only T1 band or both T1 and T2 band are developed, the test indicates for the presence of antibodies to Pf in the specimen. The result is Pf positive. 2.2 In addition to the presence of C band, if only T2 band is developed, the test indicates for the presence of antibodies to Pf, P. vivax, oval, and or malariae in the specimen. The result is positive. 3. INVALID: If no C band is developed, the assay is invalid regardless of any burgundy color in the T bands as indicated below. Repeat the assay with a new device. In addition to the presence of C band, if only T2 band is developed, the test indicates for the presence of antibodies to Pf, P. vivax, oval, and or malariae in the specimen. The result is positive.